Introducing a new relationship with “Nature” in our cities is one of the emerging trends of twenty first century urbanism, yet there is little agreement about how urban life & nature are to be designed, planned and managed. Having overcome the antagonism between rural producers and urban consumers, we want to search for new pacts between city and nature. We believe green is much more than an aesthetic alibi, much more than a passive response to the occupation of territory. We believe that ecological principles can be an active substrate for the construction of a fertile -yet dense urban form. It is therefore necessary that nature and its production capacity be incorporated into the programming of the city and the design of the built fabric. 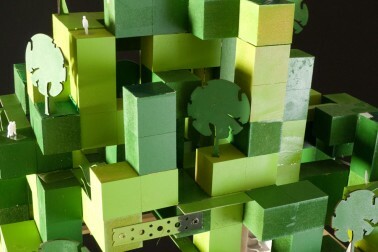 3D Nature seeks to reconsider the spatial, biological, and metaphorical construct of “Nature” in our cities. Can ecological principles be an active substrate for the construction of a fertile and dense urban block? Can the city be understood as a living machine? Can we design our new housing blocks based on novel ecosystems? Can Nature be understood as a provider of ecosystem services? What are the spatial and cultural landscapes resulting from introducing Nature in the compact city? If the infrastructures have traditionally been the generating lines of urban development, is it not time to make the ecological, agricultural or forestry production a new ferment? 3D Nature seeks to experiment with the fabrication of the city of the future though state of the art green planning, food production, ecology, health and biodiversity. This in turn should construct a new relationship with the rural landscape. If the future of humanity relies on the collective benefits of urban density, it is essential to reduce both land consumption and the energy needed to construct and operate the horizontally dispersed city. Can thus greenery, landscape or production traditionally restricted to the ground level continue up and into the building? Students will be asked to design urban blocks that include traditional urban uses, yet producing food and energy, cleaning their own water, recycling their own waste and holding a great degree of biodiversity. A symbiotic world of people, plants and animals. Can this symbiosis between city and countryside in one spatial envelope offer essential argumentation to the global concerns regarding of urbanization and consumption?